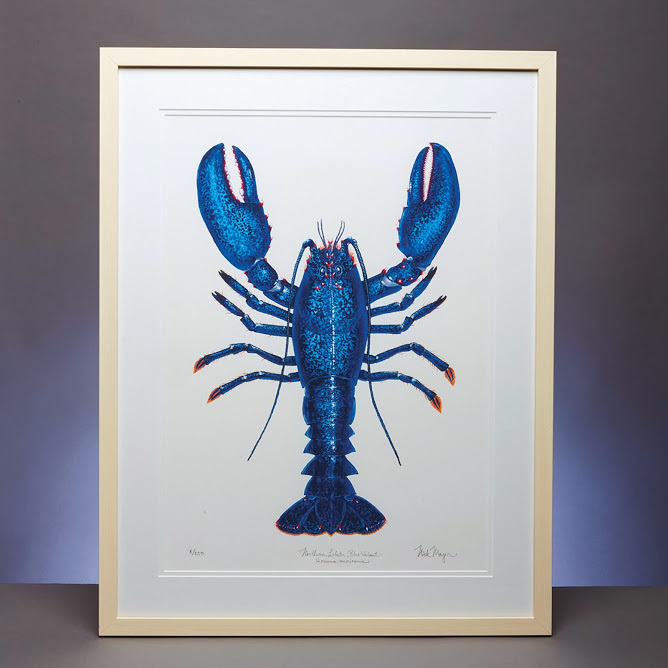 I met Nick Mayer when ordering a gorgeous Blue Lobster print of his. I have this thing about Blue Lobsters, seeing them in Maine and as a metaphor for innovation in that this rare phenotype results from serendipity and random collisions of genes. Nick's art is an amazing and beautiful integration of art and biology in watercolor. Here is Nick's powerful story of how Science is Art and Art is Science. Art and science have played an analogous, ever-present role in my evolution as a person, like two arms of a chromosome swinging in a cell’s cytoplasm during metaphase, at times distant then colliding and exchanging information. As a child I always was interested in nature. I remember summer days catching frogs and turtles that in my nostalgia appear as a deep uninterrupted trance. 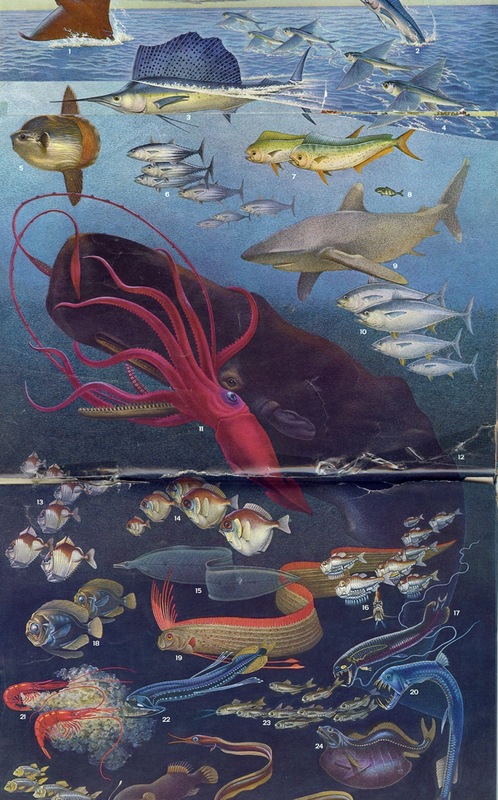 I recall hours studying the illustrations of deep-sea fish in my Time Life Series book The Sea. Between the turtles, the illustrations in The Sea, and the romance of Treasure Island, I was launched on a trajectory that needed to seek out adventure, The Seaanalyze the world through intense observation, and then make sense of it through drawing. I rejected the status quo for a while seeking adventure aboard commercial fishing boats in Alaska and elsewhere, but eventually that adventure seeking turned inward. After receiving undergraduate and graduate degrees in biology, I spent two decades working as a scientist. I wore the hat of fisheries biologist, science teacher, environmental scientist, and even worked on an extraordinary robotics project, but in the end while the science jobs paid the bills, what I was really passionate about was painting. A year and a half ago I simply could not hold the cork on my 24/7 geyser of creativity any longer and took the plunge into working for myself as a full time artist. All of my experiences as a scientist have given me the background to be the artist I am today. The transition to being an artist was a natural progression. 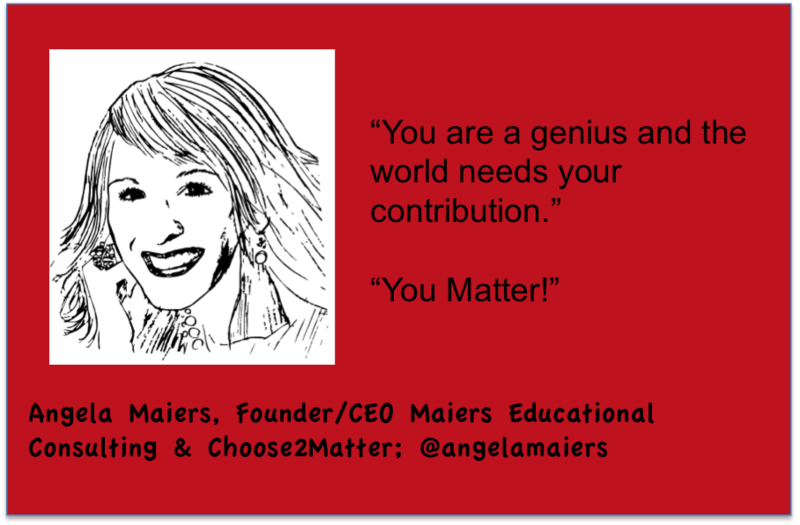 In my mind art and science are so similar—the cornerstone skill of each is astute and reflective observation. Both science and art are ways of making sense of the world, physics could not exist without 3D modeling, anatomy could not exist without illustration. In early days science WAS art and pretty much that was it. Look at the painstakingly scientific, yet beautiful art of Ernst Haeckel. The work of the naturalist in Darwin’s time was to be an illustrator. 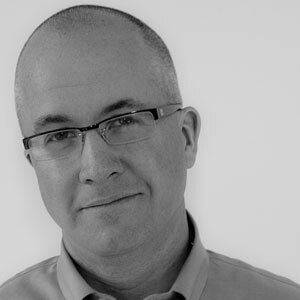 Biology was the study of form and function and its resulting taxonomy. In Darwin’s Voyage of the Beagle Part IV: Fish, the entirety of the text is a description of W Hawkins’ illustrations, “There are no scales on the snout or jaws, or between the eyes, or on the anterior portion of the suborbital . . .” (pg 4). The entirety of Grey’s Anatomy is the same, painstakingly astute descriptions of observations and the associated engravings. 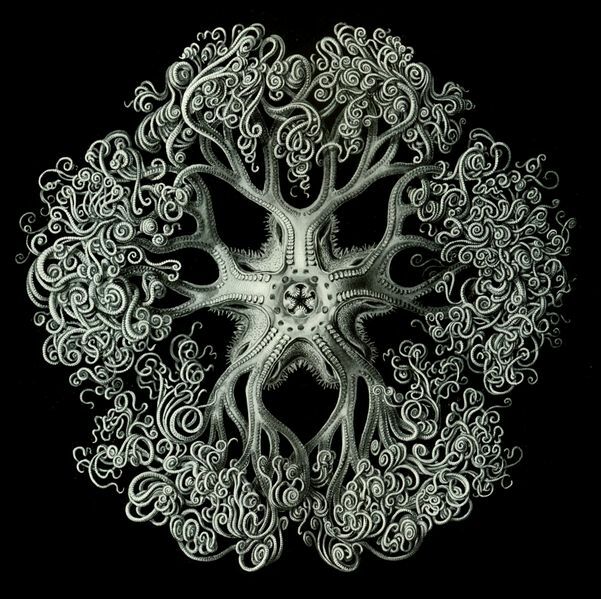 All this connectivity makes me scratch my head and wonder why STEM wasn’t always STEAM and why such a Haeckel Crinoid distinction is made between science, stereotypically left brained/ logical/ necessary and art, seen as right brained/ touchy feely/ optional. My twenty years of work as a scientist has lead me to the conviction that science is subjective, based on context, and completely dynamic. At first glance it is obvious that my work is highly influenced by science. It is influenced by the master pioneers in this genre like Haeckel, Hawkins, & Audubon, who inspire my work. While I am not the first person to have observed, painted, and classified a blue lobster, painting is the process by which I understand the blue lobster. Once I’ve stared at a seemingly random pattern on a fish’s back for hours and hours, there is always a point at which I realize that it is not random; there is a pattern here, its just a very complicated one. And then I paint it. My most recent commissioned painting, a coelacanth, is a great example of this. The coelacanth is essentially a living dinosaur—based upon the fossil record it was thought to have gone extinct 80 million years ago and then a live specimen was caught in the Indian Ocean in 1938. They are the closest link between fish and the first amphibians, which made the transition from sea to land in the Devonian period. There is no other fish that looks remotely like a Coelacanth with their large head of bony plates, missing backbone, triangle-shaped spots, and small arms with hand-like fins on the ends. Since sightings are relatively rare, especially of live, unstressed specimens, I had a real struggle trying to find some accurate reference photos for the color of these creatures. Of course, as with most rare species discovered these days, the current status is not a pretty one. Despite the creation of a Marine Protected Area, the coelacanth are now being dredged from the depths by Japanese deep trawlers and the Tanzanian Port Authority has plans to create a deepwater port in the vicinity the sanctuary. 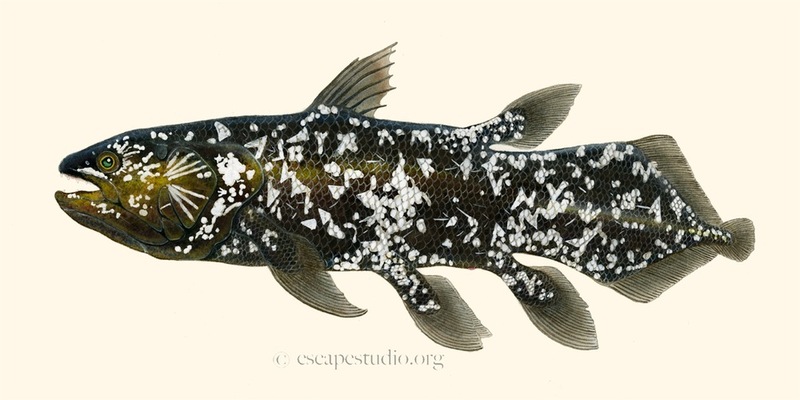 I will be donating a portion of my entire Coelacanth print sales to Oceana, one of the most solid organizations dedicated to protecting the worlds oceans.